The inaugural Seattle/Mainstreet Festival of New Musicals concluded a week ago, and I had a fantastic time meeting and working with so many local actors, artists, and composers, not to mention playing one of my favorite Austen characters– the tenacious, music-minded Mary Bennet. Yet, dear readers, there is unfinished business, and it has been preying on my mind ever since our concert readings of Pride and Prejudice at S/MS. Mary has an uncertain relationship with pitch. Poor Mary. Her music master obviously never did ear training, because she is forever tuning her pitches with less than 100% accuracy. How to fix that? Get thee to a choir, Mary! Choral singing is an excellent way to learn how to listen and tune vocally. Yet it’s possible that Mary’s choral opportunities in Meryton are limited. My other suggestion for Mary would be to learn a stringed or other instrument that requires frequent tuning and careful listening. 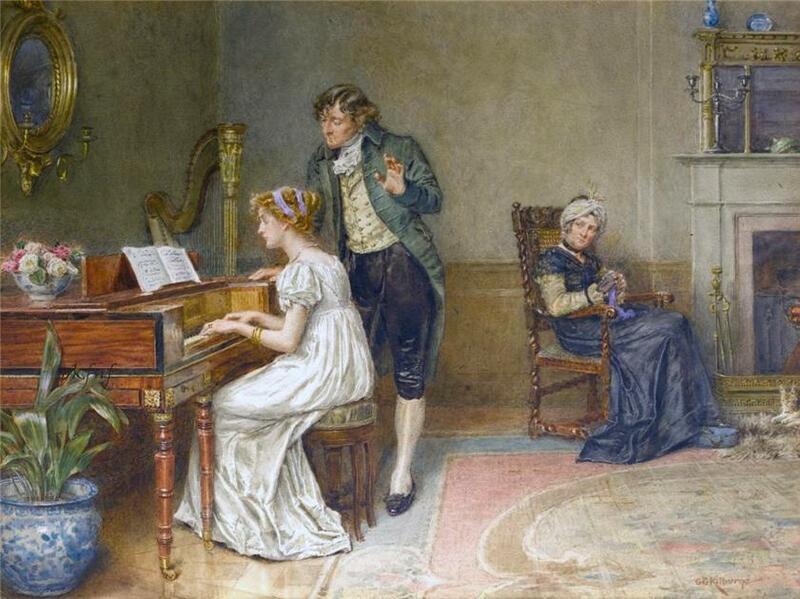 Alas, Mary’s circumstances limit her to a pianoforte; wealthier families like the Bingleys or Darcys may have a harp. Time to befriend Georgiana Darcy, Mary. Mary is unable to maintain a consistent tone. Oh, Mary, Mary. Her vocal placement is all over the map, causing her resonance to oscillate wildly between a shrill high soprano, a breathy, over-aspirated middle and a strident mix voice (the latter of which would have been an objectionable sound to the ears of Mary’s Regency listeners). Mary could use the help of a vocally savvy music master, who might be able to explain placement and resonance in terms that allow her to achieve a warmer, more expressive, and gently vibrating tone throughout. Mary is not very comfortable with her passaggio. Mary has found a few places in her voice where she easily has vocal power (if not skill) available to her, and when she gets to sing those, boy, do we know it. But they’re on the opposite ends of her range, and in the middle? Well, that’s where it gets dicey, and why some of her pitch jumps have a yodel-y quality, because she’s riding roughshod over her passaggio (vocal break), and it shows. If Mary and her music master spent more time introducing proper breath support to the rest of her vocal range, she’d be able to navigate a greater range of pitches with more ease and smoothness. This is a hard one, because it’s subjective, and therefore much harder to determine and teach. I am guessing that Mary’s melodramatic song stylings spring from her desperation and determination to make an impression on her audience. In Mary’s mind, more drama = a better performance. This self-conscious choice prevents Mary from paying attention to the clues that the composer gives her– in the melodic line, markings, and the piano accompaniment – to discover the styling inherent in the piece itself. What Mary really needs is a friend or sister with more developed taste, who can encourage Mary to explore those subtleties of musicianship, and convince her that focusing on the music as written, rather than her own showboating, would benefit her performance. Of course, all of these ideas presume that Mary is open to receiving suggestion about her musical development…would Mary listen to advice? I leave it to you. Posted in Rehearsal Notes, Staged Readings and tagged as character, jane austen, musical theatre, pride and prejudice.